The reviewer received a galley from the publisher. Susan Stockdale, author and illustrator of Stripes of All Types and Bring on the Birds, has a new informational picture book for very young readers. Spectacular Spots features spotted creatures in their natural habitats. Each page includes a colorful acrylic painting with a few words of rhyming text on the bottom of the page, making the book accessible to emergent readers. Readers will enjoy reading about animals that are familiar (snakes, owls and turtles) and even a few that are not familiar such as the quail. The text is short, but Stockdale does not shy away from using rich vocabulary words such as "strutting," "grazing" and "flair." A two-page spread in the back of the book provides facts about each animal featured in the book. For example, the spots on the sea slug warns predators that it's poisonous. Turn the page, and you will find twenty different spotted patterns that readers can try to identify for fun. It may appear to be a simple book, but there is a lot packed into this beautiful picture book. 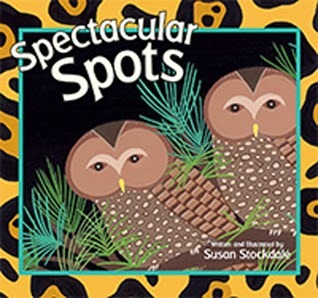 Spectacular Spots can read by an adult to a child, it may be read aloud in a story time setting, and early readers will enjoy reading the rhyming text on their own. It may also serve as a jumping off point for readers who are interested in learning about science and animals. Visit Susan Stockdale's website to view examples of artwork from the book.